The ancillary events that happen around Coachella have nearly become as big a deal as the festival itself. In fact, there are plenty of people who head out to the desert during fest weekends just to do the party circuit and never actually set foot inside the Polo Grounds. Want to know where to pool party with it girls and influencers or catch main stage musicians playing far smaller events? Here’s our guide to Coachella parties, pop-ups, and activations. Desert Beach Club: The owner of L.A.’s 1OAK nightclub teams up with V Magazine and concierge app Velocity Black for this VIP event. This year’s theme is French Riviera poolside vibes. A-listers including Kendall Jenner, Travis Scott, Rihanna, and Alessandra Ambrosio are among those you might spot sipping rosé and getting complimentary massages. Private location. Ciroc Summer House: Hosted by Evan Ross & Ashlee Simpson-Ross, stop by this Ciroc-sponsored event for tour through Ciroc Watermelon World (full of photo ops, naturally), Ciroc cocktails, and food by chef Leandro Bongarra of Saline Restaurant in Laguna Beach’s new Hotel Joaquin. Korakia Pensione, Palm Springs. 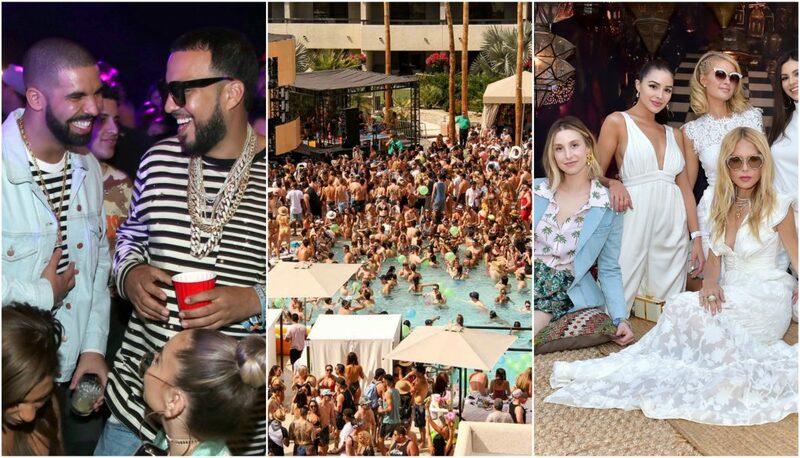 Day Club Palm Springs: Splash the weekend away at this daytime event featuring top-notch DJ talent each day. Diplo, Dillon Francis, and Rüfüs Du Sol are among the performers to expect. Hilton Palm Springs; tickets $30-$75. STK & LiveMe Parties: This trio of invite-only events is organized by LiveMe, SKAM Artists, and Apex Social Club. Guests will dine on fare by L.A.’s STK Steakhouse and enjoy drinks by the Barbershop Club and Cocktails. Private location. KROQ House: L.A.’s rock radio station takes over an Indio estate for this annual event which, this year boasts some top talent. The 1975, Billie Eilish, Khalid, and Bob Moses are among the performers, and guests will nosh on great fare from local resto Eureka!. While officially invite-only, KROQ offers a chance for fans to enter to win admission. Private location. ZOEasis: Rachel Zoe was a pioneer in the world of boho-chic Coachella parties, and returns for her fifth annual ZOEaisis event. The stylish affair highlights partnerships with Sephora, Swatch, and Sunseeker Rosé. A Rocketman-inspired photo station serves Elton John looks. The Parker, Palm Springs. Secular Sabbath: Two Bunch Palms, a spa retreat dating back to the ’40s, becomes a very modern wellness destination over weekend one. Secular Sabbath includes special music, workshops, massages, and more, and features a partnership with dosist. Helicopter service BLADE and dosist are also partnering on ferrying fans to the desert in style. Two Bunch Palms, Desert Hot Springs; Reserve. REVOLVEfestival 2019: Practically as big as the official fest–and packed with style stars and influencers galore–#REVOLVEfestival is an annual affair not to be missed. The lineup includes SZA, Tyga, ScHoolboy Q, SOSUPERSAM, Offset, Saweetie, and more. The event is invite-only, but the public can enter to win passes. Private location. TAO x REVOLVE Desert Nights: After you’ve danced the day away at REVOLVEfestival–or, hey, even Coachella itself–it’s time for the after-party. The hottest ticket in the desert is this event from nightlife supergroup TAO, attracting the likes of Kardashians, Jenners, and even our boy Timothée Chalamet. Private location. beGlammed Sunset Soiree Presented by Fullscreen: Hosted by Shaun Ross and DJ Joel Mignott, this party is all about getting festival chic. Guests can stop by braid bars, glitter stations, makeup counters, and even get fresh ear piercings on site. A luxe gifting suite and poolside tunes round out the affair. Private location. DoLab Stage: Curated separately from the other stages–but no less exciting–this dance-focused area is an annual favorite. This year, performers will include RY X, Pete Tong, Madam X, DJ Nu-Mark, and more. For updates and surprise guests, fans are encouraged to text DOLAB to 55222. More information. Heineken House: In between main stage sets, be sure to duck into the Heineken House for constant programming and a break from the sun. Headliners include The Roots, De La Soul, Pete Tong, and other pretty big names. More information. #MYCALVINS House: Tucked between the Gobi and Mojave Tents, make a diversion to check out #MYCALVINS House. This activation from Calvin Klein will offer a “multisensory experience” inspired by the label’s most recent ad campaign. Absolut Planet Tent: Absolut is the official vodka of Coachella, so they get their own fancy bar, complete with refreshing drinks, cute photo backdrops, free WiFi, and music. Oh, and air conditioning, which is the greatest gift of all. BMW #RoadtoCoachella Pop-Up Experience: Coachella is a popular excuse for a SoCal road trip and BMW celebrates that vibe with this pop-up experience at their Palm Springs dealership. There will be a chance to meet and greet with superstar Khalid, installations inspired by his upcoming album, custom cars, and other things to check out. BMW of Palm Springs.